Affing: The German capital city of Berlin will be playing host to a very special kind of summit meeting on 5 July this year when the country's most innovative small and medium-sized enterprises (SMEs) gather for an awards ceremony. Project mentor Ranga Yogeshwar will be presenting them with the compamedia Top 100 prize for innovation at the city's Axel Springer Passage centre. This is the 20th year that compamedia's accolade for innovation has been awarded and Pfister Waagen Bilanciai GmbH from Affing in southern Germany is among the companies being honoured. A Top 100 company, Pfister Waagen Bilanciai GmbH is a world leader thanks to its innovation processes. The Affing-based producer and distributor of weighing equipment and weighing technology has a 60 per cent market share in Germany and a dominant position in international markets. “If the Vietnamese customs authorities want to purchase weighing equipment, they don't buy it in China, they buy it from us,” says managing director Harald Welscher. That is ultimately to do with the quality of the product. Welscher is proud of the fact that his company of sixty employees manufactures its own load cells and measurement sensors - the building blocks of all weighing equipment - instead of buying them in. “This gives us control over all the components that are essential for taking exact measurements,” says Welscher. And thanks to changes made to its internal organisation and information flow, the Bavarian company has also managed to reduce its cost base by 17 per cent. For Welscher and his colleagues, being innovative also means looking for new areas of application. Industrial scales are mainly used in the building and waste management sectors. However, Pfister has also designed scales for use in the renewable energy sector. In biomass power stations, they are used to weigh wood pellets, wood chips and straw. “We have developed specially adapted products and applications for these functions that, ten years ago, no-one would have dreamed of,” says Welscher. In addition to Pfister Waagen Bilanciai, a further 102 firms in a total of three size-based categories will be receiving the Top 100 seal of approval. They include 51 German market leaders and 21 global market leaders. Roughly two-thirds of these firms are family-owned businesses. All of these companies together generated total revenue of approximately €13.5 billion in 2012. The Top 100 leading innovators reinvested around 10 per cent of this revenue directly in research and development, whereas German small and medium-sized enterprises in aggregate spent only 1.4 per cent on R&D. Consequently, the award-winning firms are more successful: they generate 42.6 per cent of their revenue from products and services that they have only brought to market in the last three years, while the corresponding figure for German SMEs as a whole is a much lower 8.9 per cent. This has meant that 86 of the Top 100 firms (83.5 per cent) have generated growth that has outperformed the respective industry average – by almost 15 percentage points on average – over the past three years. The project's mentor is the journalist and television presenter Ranga Yogeshwar. Since 2002 this project has been managed by Professor Nikolaus Franke from the Institute for Entrepreneurship and Innovation at the Vienna University of Economics and Business. The focus of his research is on entrepreneurship, innovations management and marketing. He is one of the world's leading experts in the field of user innovation. 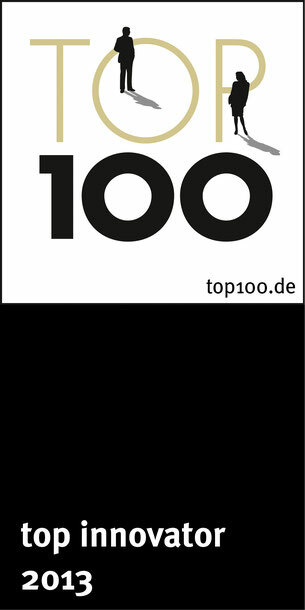 The Fraunhofer Society for the Promotion of Applied Research is acting as the Top 100 project partner and the Süddeutsche Zeitung newspaper is the media partner. compamedia GmbH was founded in 1993 and has a team of 19 employees who organise the Top 100, Top Job and Top Consultant competitions for German SMEs. It also launched the Ethics in Business initiative. It supports and awards prizes to small and medium-sized firms for outstanding achievements in the fields of innovation, human resources management, consulting and corporate social responsibility. compamedia works closely with leading universities on these projects.